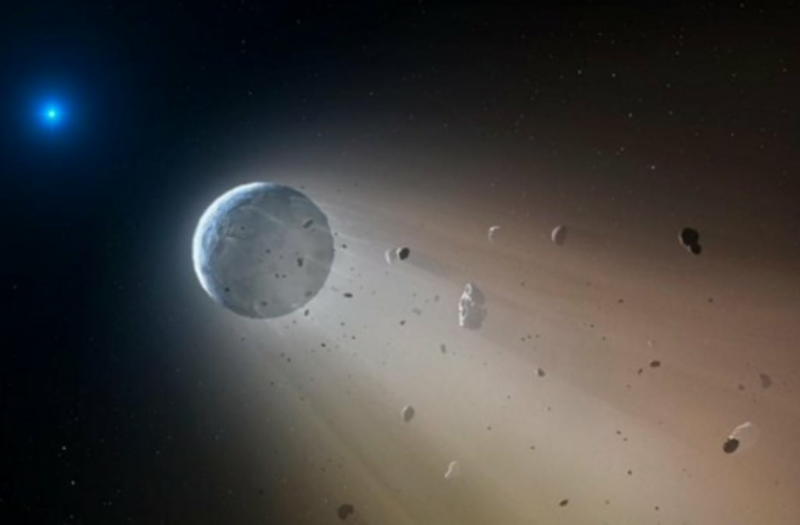 In an event that sounds more like an episode of 'Star Wars' than one of reality, scientists have discovered evidence of a death star literally ripping a planet apart with its gravity. This unbelievable discovery validates the theory that white dwarf stars are capable of "cannibalizing possible remnant planets that have survived within its solar system." What exactly is a white dwarf star, you ask? NASA explains, "As stars like our sun age, they puff up into red giants and then gradually lose about half their mass, shrinking down to 1/100th of their original size to roughly the size of Earth. This dead, dense star remnant is called a white dwarf." As this is the first time scientists have ever seen this "catastrophic destruction" in action, it's a pretty monumental moment for astronomers! NGC 2207 and IC 2163, which are located about 130 million light-years from Earth, in the constellation of Canis Major. Volunteers using the web-based Milky Way Project brought star-forming features nicknamed "yellowballs" to the attention of researchers, who later showed that they are a phase of massive star formation. The yellow balls -- which are several hundred to thousands times the size of our solar system -- are pictured here in the center of this image of the W33 star forming region taken by NASA's Spitzer Space Telescope. Infrared light has been assigned different colors; yellow occurs where green and red overlap. The yellow balls represent an intermediary stage of massive star formation that takes place before massive stars carve out cavities in the surrounding gas and dust. Within the swaddling dust of the Serpens Cloud Core, astronomers are studying one of the youngest collections of stars ever seen in our galaxy. This infrared image combines data from NASAs Spitzer Space Telescope with shorter-wavelength observations from the Two Micron All Sky Survey (2MASS), letting us peer into the clouds of dust wrapped around this stellar nursery. A new image from NASA's Spitzer Space Telescope, taken in infrared light, shows where the action is taking place in galaxy NGC 1291. The outer ring, colored red in this view, is filled with new stars that are igniting and heating up dust that glows with infrared light. The stars in the central area produce shorter-wavelength infrared light than that seen in the ring, and are colored blue. This central area is where older stars live, having long ago gobbled up the available gas supply, or fuel, for making new stars. Millions of galaxies populate the patch of sky known as the COSMOS field, short for Cosmic Evolution Survey, a portion of which is shown here. Even the smallest dots in this image are galaxies, some up to 12 billion light-years away. The square region in the center of bright objects is where the telescope was blinded by bright light. However, even these brightest objects in the field are more than ten thousand times fainter than what you can see with the naked eye. The ghostly structures highlighting the peculiar patterns of orbiting stars in the center of the galaxy NGC 1291 stand out vividly in this specially-processed image from NASA's Spitzer Space Telescope. By making detailed observations of the galaxy in infrared light, astronomers can tease out the hidden details of the strange dynamics in this barred galaxy. The destructive results of a mighty supernova explosion reveal themselves in a delicate blend of infrared and X-ray light, as seen in this image from NASAs Spitzer Space Telescope and Chandra X-Ray Observatory, and the European Space Agency's XMM-Newton. A galaxy about 23 million light-years away is the site of impressive, ongoing, fireworks. Rather than paper, powder, and fire, this galactic light show involves a giant black hole, shock waves, and vast reservoirs of gas. This image is a tiny snippet of the vast 20 gigapixel GLIMPSE360 panorama released in March 2014. Visitors were encouraged to use the web viewers on the Spitzer site to search through the data and then share and name their findings on Twitter. This region was tweeted by @kevinmgill, who tagged it "Nebula Does Not Approve." Roguish runaway stars can have a big impact on their surroundings as they plunge through the Milky Way galaxy. Their high-speed encounters shock the galaxy, creating arcs, as seen in this newly released image from NASA’s Spitzer Space Telescope. The collection of red dots seen near the center of this image show one of several very distant galaxy clusters discovered by combining ground-based optical data from the National Optical Astronomy Observatory's Kitt Peak National Observatory with infrared data from NASA's Spitzer Space Telescope. This galaxy cluster, named ISCS J1434.7+3519, is located about 9 billion light-years from Earth. This planetary nebula, known as NGC 650 or the Little Dumbbell, is about 2,500 light-years from Earth in the Perseus constellation. 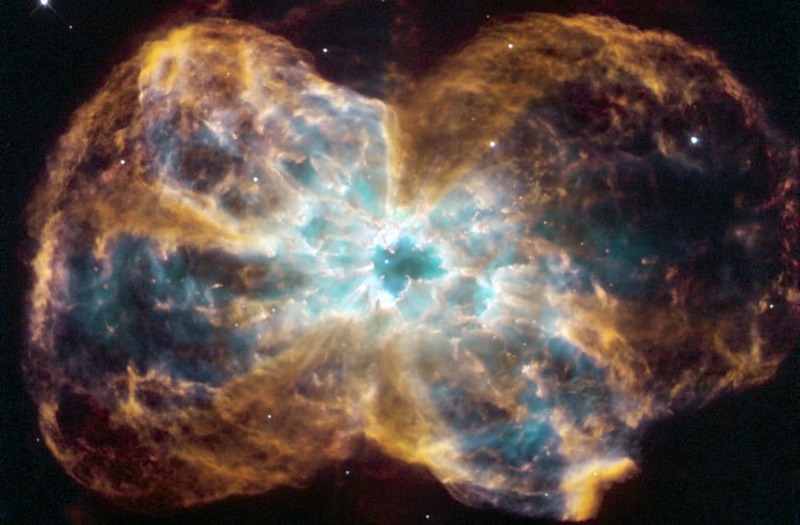 Unlike the other spherical nebulas, it has a bipolar or butterfly shape due to a "waist," or disk, of thick material, running from lower left to upper right. Fast winds blow material away from the star, above and below this dusty disk. The ghoulish green and red clouds are from glowing hydrogen molecules, with the green area being hotter than the red. The famous Horsehead nebula seen in visible-light images (inset) looks quite different when viewed in infrared light, as seen in this newly released image from NASA's Spitzer Space Telescope. The giant star Zeta Ophiuchi is having a "shocking" effect on the surrounding dust clouds in this infrared image from NASAs Spitzer Space Telescope. Stellar winds flowing out from this fast-moving star are making ripples in the dust as it approaches, creating a bow shock seen as glowing gossamer threads, which, for this star, are only seen in infrared light. The spiral galaxy NGC 3627 is located about 30 million light years from Earth. This composite image includes X-ray data from NASA's Chandra X-ray Observatory (blue), infrared data from the Spitzer Space Telescope (red), and optical data from the Hubble Space Telescope and the Very Large Telescope (yellow). The inset shows the central region, which contains a bright X-ray source that is likely powered by material falling onto a supermassive black hole.